Today's announcement of three new Instant Ink-eligible printers brings the total to 17. HP launched its Instant Ink service last year, enough time to reflect on the new service. In a briefing yesterday, HP Inkologist Thom Brown told us the service has been popular with customers for both its convenience and cost. Welcome Kit. Your first delivery. We'll be taking an in-depth look at it over the next few months but in this article we'll look at how HP has turned a product like ink into a popular service. Key to the service is having an HP printer that can connect to the Internet. With today's introduction of three new HP printers, that list includes 17 models in the Envy, Officejet and Officejet Pro series. Add an Internet connection, your email address and a credit card and you've got all the prerequisites to sign up. "Kit Contents. Cartridges, return mailer, instructions. When your printer detects its ink cartridges have reached a certain threshold, it simply orders more ink for you. The new ink cartridges are shipped to you, HP says, in plenty of time to replace the low ones. You pack up the old cartridges in a mailer HP provides to return them for recycling. HP is rightly proud of its pioneering recyling efforts that date back to the last century. You never have to go to the store, never have to remember to order ink, never have to remember your cartridge number or keep a set in stock. A fresh set of cartridges are supplied just when you need them, as if by magic. What you don't use of your allotment can be rolled over into the next month up to the monthly allowance. So you can rollup to 50 unused pages in the $2.99 plan. And if you want to print more than your monthly allotment, you can buy an additional set of pages. On the $2.99 plan, you can buy 15 more pages for a dollar. On the $4.99 plan, you can buy 20 more for a dollar and on the $9.99 plan you can buy 25 more for a dollar. You can also switch plans or even stop the service at any time and just buy ink the old fashioned way (there's nothing special about the cartridges, just the printers). It's flexible. So how do you tell how many pages you've printed so far? A Web site for your Instant Ink account can tell you, Brown said. And down the line, the printer (which certainly knows) may be persuaded to reveal the details, too. 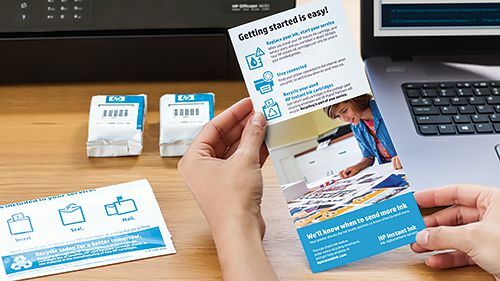 HP estimates customers spend $36 a year on the $2.99 plan using Instant Ink where they would have spent $132 on standard size cartridges (rather than the more expensive XL cartridges that have more ink). That's a savings of $96 a year. Similarly the $4.99 plan would cost $60 a year instead of $264, saving $204. And the $9.99 plan would cost $120 a year instead of $792, saving $672. And what's the cost per page? HP did the math for us. On the new Envy 4520 or Officejet 4650, a $15.99 black cartridge would print 190 pages (0.084 cents a page) and a $21.99 color cartridge would go for 165 pages (0.133 cents a page). That's 0.217 cents a page when you buy the standard cartridges yourself. You can get that down to 0.170 cents a page buying the $31.99 XL black or $33.99 XL color versions of the cartridges, which pack more ink in them. But with the 50-page Instant Ink program, it costs 0.60 cents a page. The 100-page plan takes that down to 0.050 cents and the 300-page plan runs just 0.033 cents per page. The plans are based on the number of pages you print, not the amount of ink you consume. You can have all the ink you need. But your pages are monitored. On the $2.99 plan, to pay for 72 pages (each photo counting as a page), you'd need to buy 22 more pages for $2 (at 15 pages for each dollar). But you wouldn't do that because the $4.99 plan (which is the same amount you're spending on your $2.99 plan + $2) gets you 100 pages, 20 more at no extra charge. Same problem during the holidays if you send out a family newsletter. But then the nice thing is that you can paint the sheet with ink and it won't cost you penny more. There's one more twist to this approach. If you print 50 photos on letter-size photo paper, you will use more ink than if you print them on 4x6 photo paper. But, being charged only by sheet, you pay no more for ink. That also means that printing a 12-page double-spaced school report in black only and using draft mode costs you as much as printing 12 full color photos on letter-size photo paper. So you get more bang for your buck as a photographer than as a writer, you might say. We're not sure how HP can do this. We're not even sure they know how they do it. HP is presumably making at least as much profit on its Instant Inks as it does on its other inks. And the cartridges are identical. So how do they achieve lower costs? We asked if the overhead of dealing with retail operations was that hefty that the occasional user who was spending $132 a year on online or brick-and-mortar ink could really save $96 just by not buying retail. But no one at the table knew. Certainly, though, Instant Ink eliminates the retail markup required to compensate the seller. Instant Ink is a wholesale program. We'd just visited Walgreens on the weekend and noticed HP black cartridges alone for $22 and $27. That's about 10 months on the Instant Ink plan for both black and color cartridges. Brown told us that since Instant Ink is a service, it can be easily updated with special offers and bundles. In fact, as the moment, if you buy an eligible printer before Sept. 26, you can get three months of free ink when you sign up for Instant Ink. But you may one day also see bundled paper, although the company hasn't worked out the logistics of shipping heavy paper. Subscriptions have gotten a lousy reputation. But the cost of ink has an even lousier reputation. Both Epson and HP are trying to do something about it. Epson has developed EcoTank home office printers that replace cartridges with tanks that can be refilled for just $52 and supply enough ink for years. 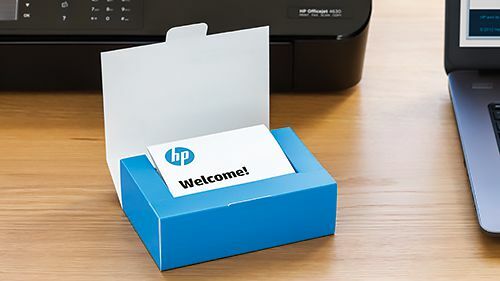 And HP's Instant Ink program not only lowers the cost like Epson but also adds the convenience of never having to worry about ordering ink or disposing of used cartridges. We're interested in seeing how well HP executes the service. We'll let you know what we find out.